[to Booth] Paradise. Mass graves for me and a beach with liquor for you. Permalink: Paradise. Mass graves for me and a beach with liquor for you. 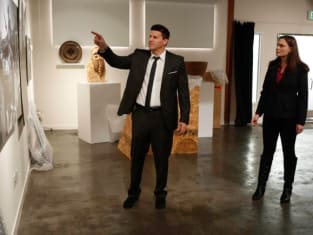 Bones: Oh, I had a brilliant idea. Booth: You always have a brilliant idea. Permalink: Oh, I had a brilliant idea. You always have a brilliant idea. Cam: I know this is hard. Arastoo: Loving you is the easiest thing in my life right now. I'd like to boast to the world about it, but that's just my ego. Cam: You can tell all of that just from a hand? Bones: Extremities can be very informative. Hodgins: Are you going to talk about the size of a man's feet now?